Happy Wednesday ladies! Today we are coming at you with "What We're Reading Wednesday!" 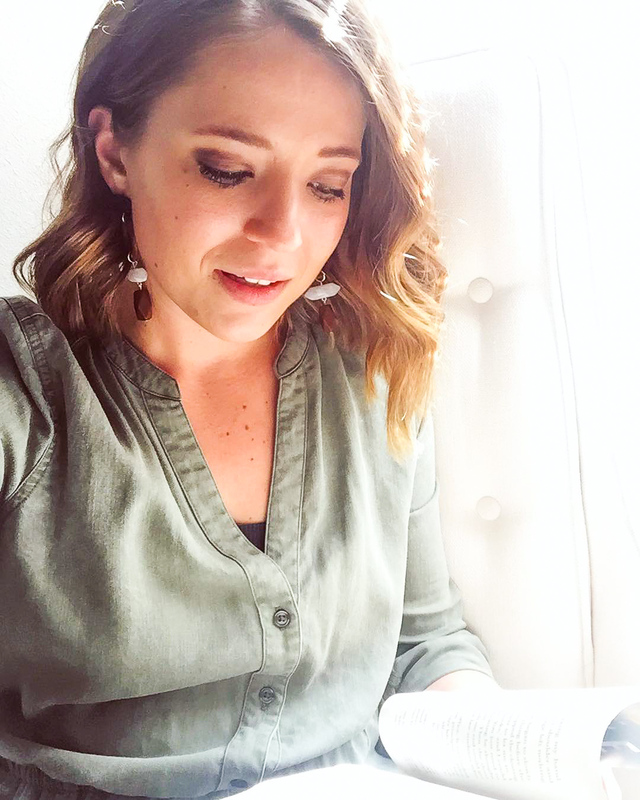 And stay tuned because following Rachel's current reads are some tips and tricks to help you structure your devo time. You know, just to get the most out of it. Now, on to Rachel's current reads! I do love a good classic read. Before I went to school for ministry, I was an English major. Literature is a lesser known passion of mine and Jane Austen a personal hero. I’ve read many of her novels, but have never had the chance to finish Mansfield Park. I decided to pick it up again this summer since I have lots of time on my hands while not “watching.” Yes, still going strong without the Netflix & Hulu! Here's where I talked about it: Summer on a Dime. When I decided to delete all of my watching apps for the summer, I mentioned it to a friend at work. We were talking about the fact that we don’t read enough anymore, and decided we would pick a summer read to work through together. We landed on this World War II historical fiction piece that has been on the best selling list for a few years now. I had heard great things about it too! I won’t lie, I usually like to buy copies of books because the literature lover in me loves to make notes and highlight. But, in the spirit of saving money, I borrowed it from a friend and am jotting down favorite quotes and thoughts in a notebook. I’m only a few chapters in but am loving it so far! I’m such a weirdo. But I loved this college textbook. I am all about reaching people with the love and truth of Jesus and doing so in their context. This book has been a favorite since my Bible college days and it resurfaced in my move. I’ve been browsing here and there just for the fun of it! It’s a great read if you have a missional heart and desire to reach all sorts of people in all sorts of cultural contexts! My current devotional that just started this Monday! (So it’s not too late to join.) It’s a study through Love God Greatly. I have mentioned a lot lately that I’m struggling with lies that I have believed for too long and lots of insecurities that come with. I’m going to work through this with a friend and we’re praying that we can overcome some of these lies that have lingered for far too long. So here's the deal, your time with the Lord, is your time with the Lord. What grows and strengthens you may not be my thing, and that's okay. With that being said, it is helpful to have a plan when approaching your devotional time. So I am giving some suggestions and tips to making the most of your devotional time. Choose your content. Whether you follow a reading guide on the Bible App (They have a TON of options! ), read through the Bible in a year (There is a reading guide in most Bibles. ), follow a devotion like She Reads Truth (They go through books of the Bible with a journal for taking notes and journaling. ), or just choose a book of the Bible to study, choosing your content is a great way to get your devotional time off to a good start. This may seem like a no-brainer, but sometimes knowing where to start can be our biggest hurdle to master. Bottom line, where you start is not as important as starting. Find your starting point and go with it! Personally I have been attempting to read through the Bible as quickly as I can in order to grasp the whole story of the Bible. Even though my pace hasn't been as fast as I had hoped, it has continued to be helpful in making connections from the Old Testament to the New Testament. This summer I am also a part of a Community Group with my church studying the book of Galatians, so after getting through the Bible (hopefully by the end of this week or next), I will focus more on an inductive study on Galatians to go along with that study. Read more about what an inductive style of Bible study looks like here. Let's be real, some days we are doing good to get our Bible reading in. This portion can be the most difficult for us, but that makes it that much more important, especially in the times we live in. Contemplation is so essential to applying the Word to our lives. We read through something, but did we really understand it? Do we know how to apply this truth to our life? We need to take time to apply the Word to our life. This could look like sitting and reflecting on what we are reading, writing down questions we have about what we read, or picking out a verse or two to meditate on and memorize throughout the day. I have heard of some people scattering note cards with different scriptures written on them throughout their house and car, so throughout the day they can be contemplating, meditating, and reciting these truths. Talk with the Lord. Whether you do this best through prayer journaling or through verbal prayer, communicate with the Lord. It doesn't have to be just a time to bring prayer needs, but it is a good time for that too! Communicate with God. Let Him communicate with you. This is also a great time to incorporate worship. Give thanks to God for all the blessings in your life. Blast some worship music and let His praise fill and flow out of your heart. Like I already said, what you do is not as important as doing something. If you are a momma, your devotional time is going to look different than women without kids. And if you have young kids your devotional time is going to look waaay different than the mom with older kids. Don't compare your devotional time with anyone else's. When you come to God He isn't comparing you with ANYONE. He is just thrilled that you came to Him. Don't get bogged down with a particular method. If you are getting bored with your devotional time, change it up! Maybe you do a guided Bible study rather than reading through the Bible in a year. If you're like me, I hate not following through with my original plan. I usually try to force my way through a reading plan even if I am not loving it for the sake of completing it. But you know what, God could care less if we complete that reading plan. He is concerned with our spiritual growth. When you aren't enjoying the content you are studying you are more likely to lack in consistency. What does your devotional time look like? Do you have a structure you like to follow? What are you currently reading/studying?